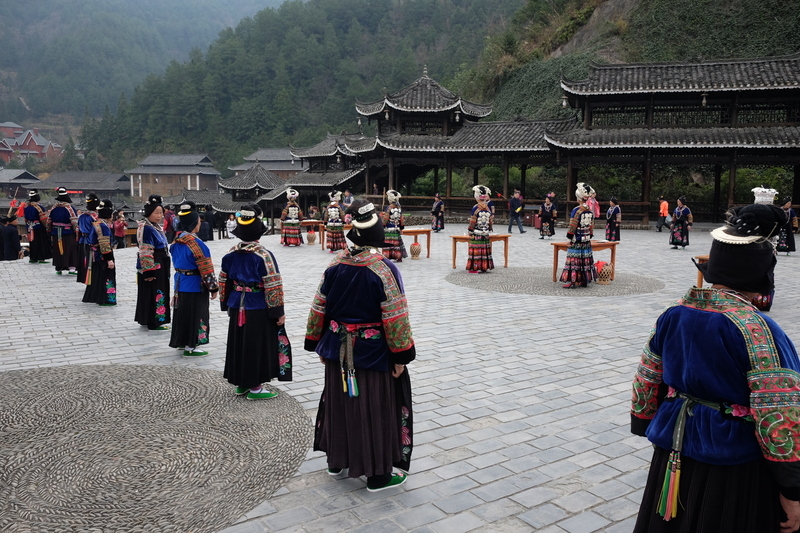 So one of the tourist highlights of Guizhou is visiting the collection of traditional ethnic minority villages in the province. There’s rather a lot so I picked one area 黔东南 “Qiandongnan” as a base and spent a few days travelling around and exploring by bus. 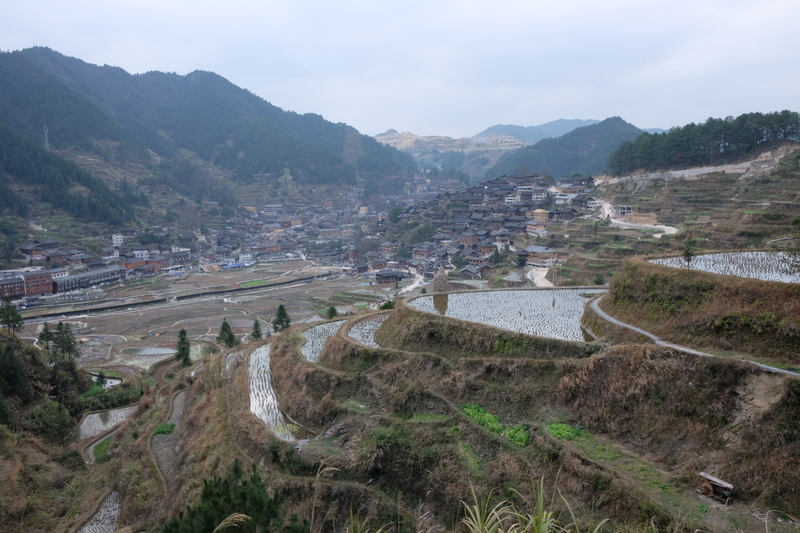 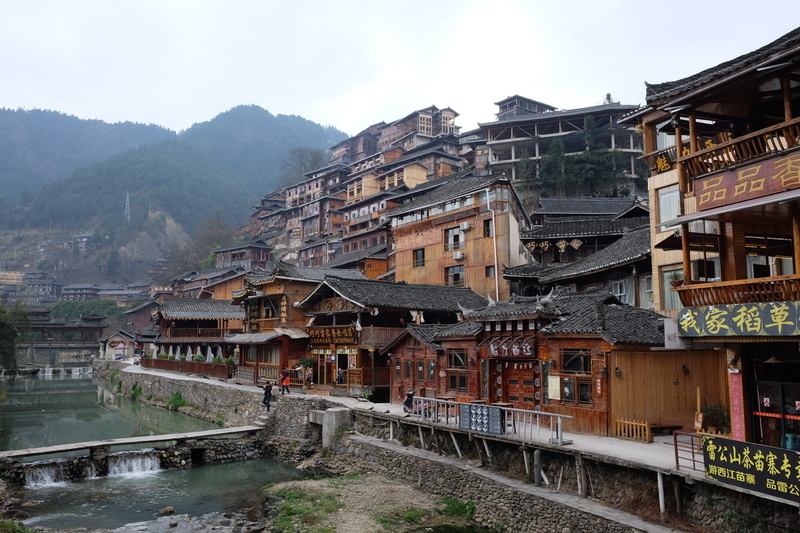 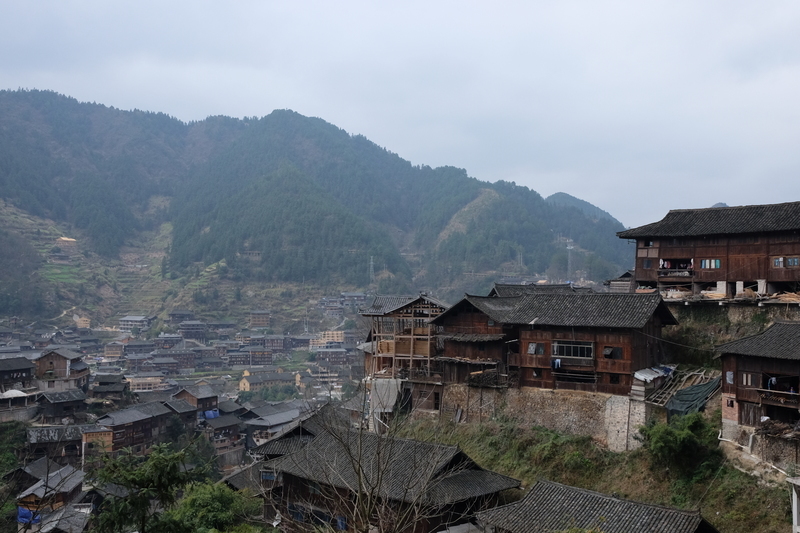 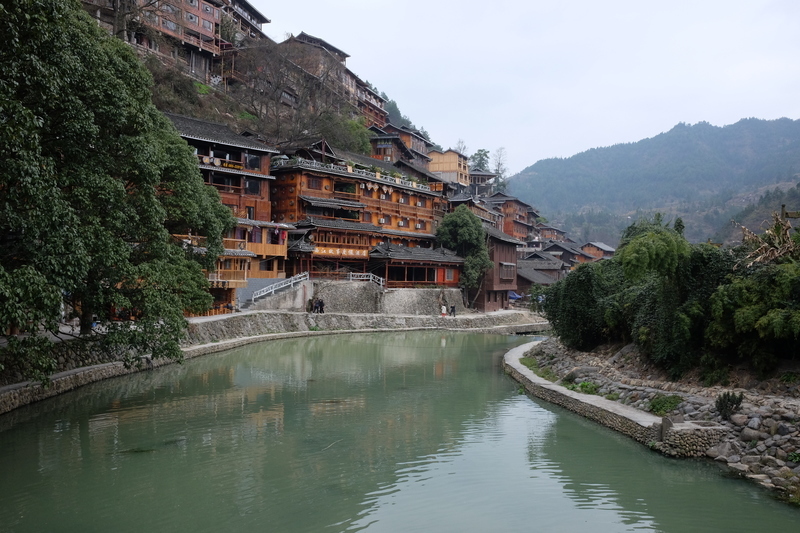 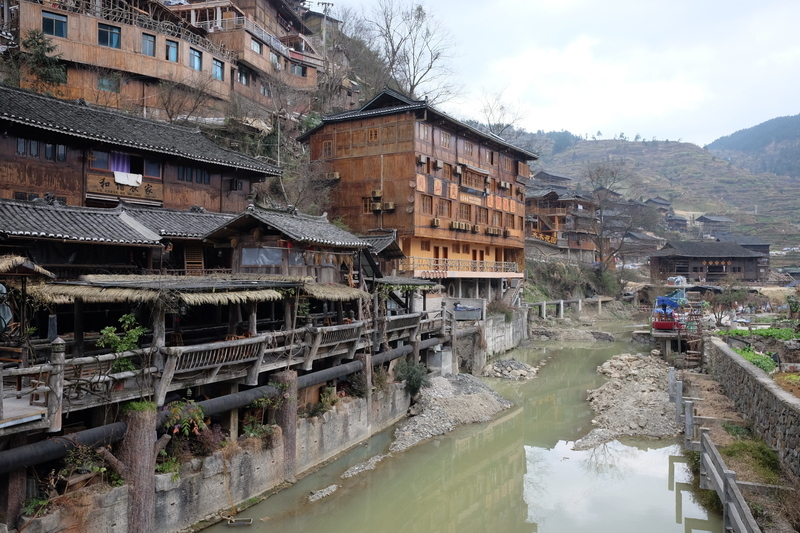 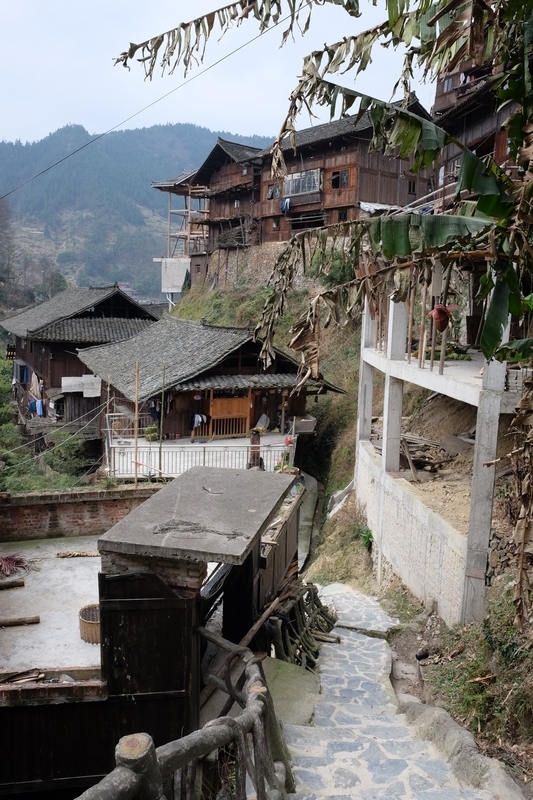 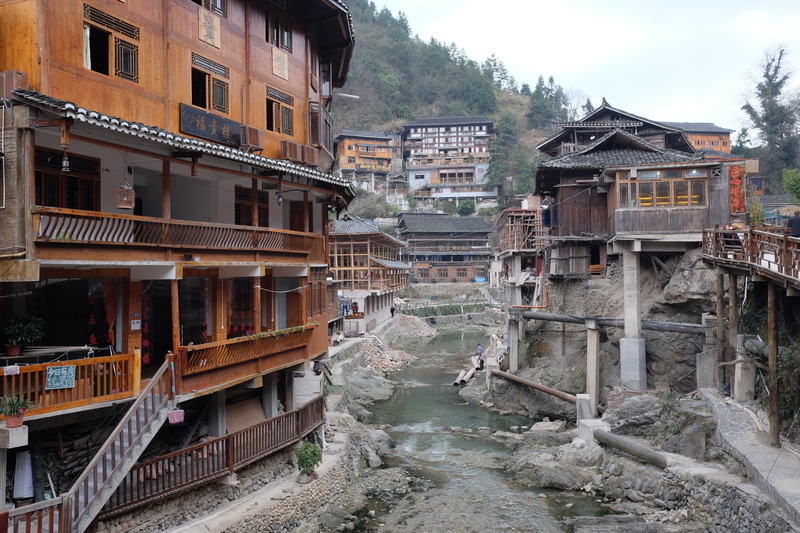 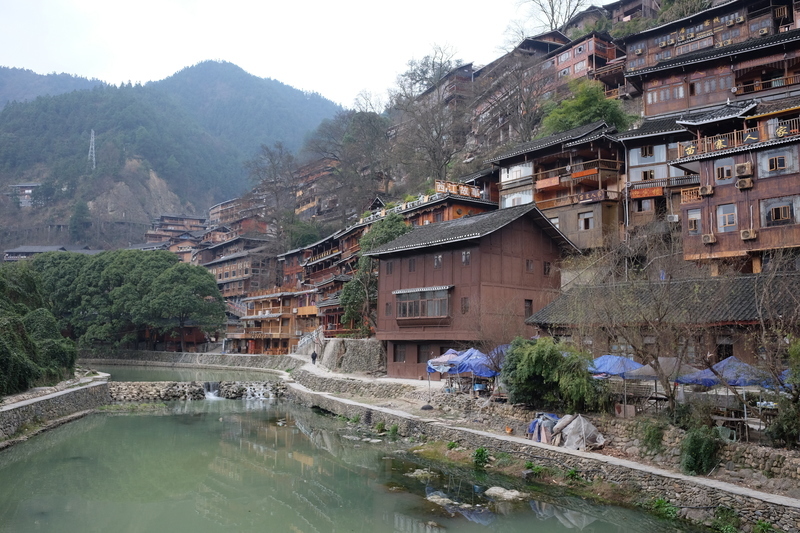 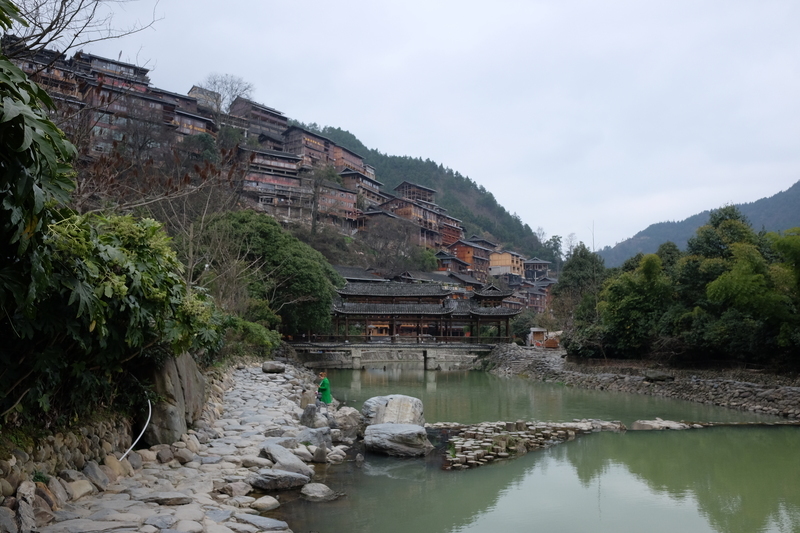 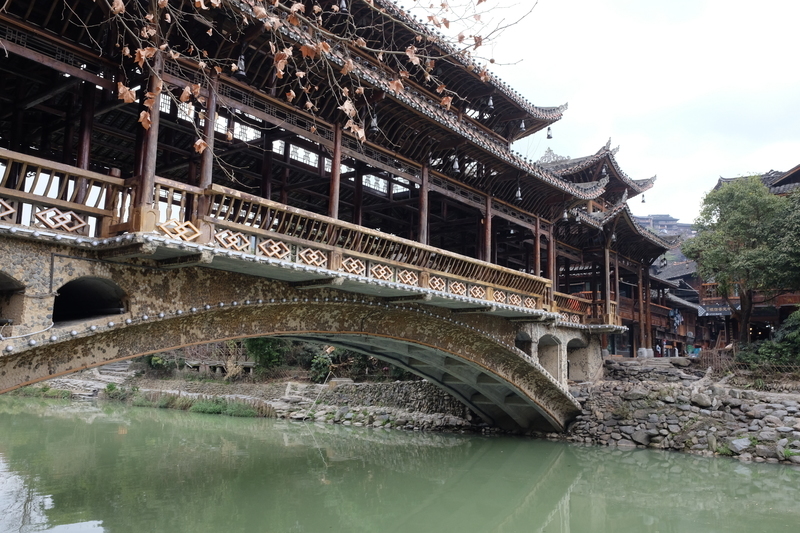 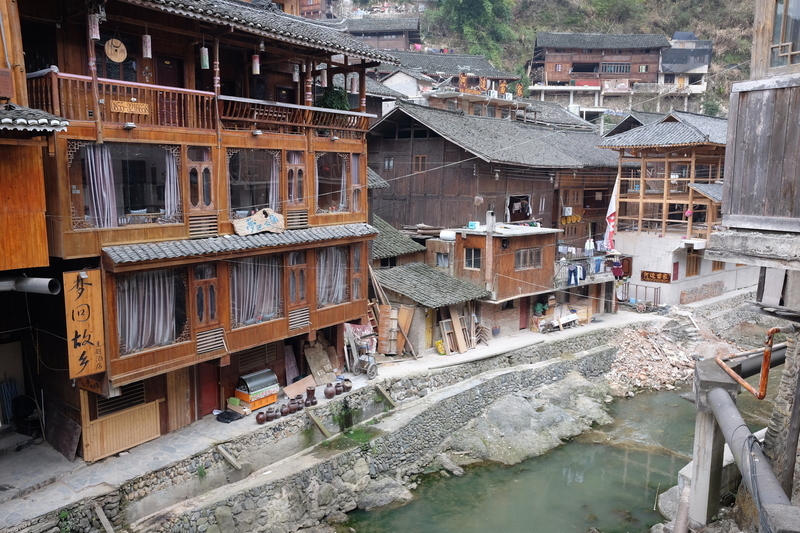 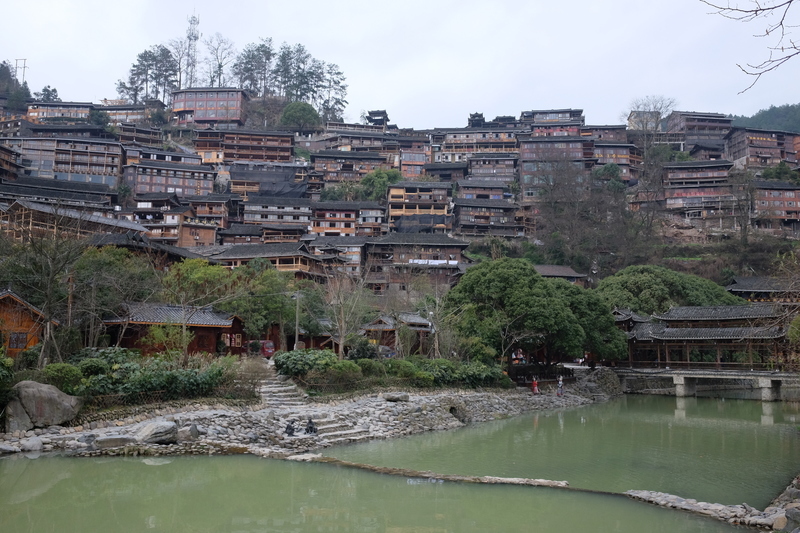 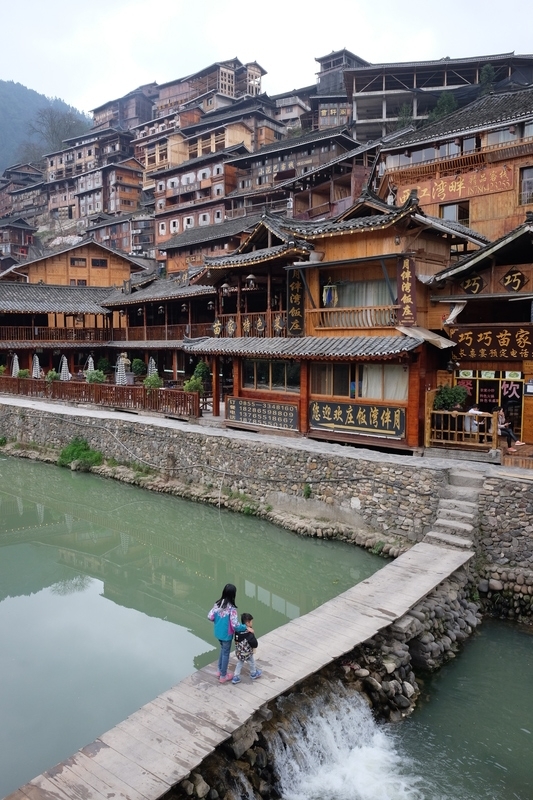 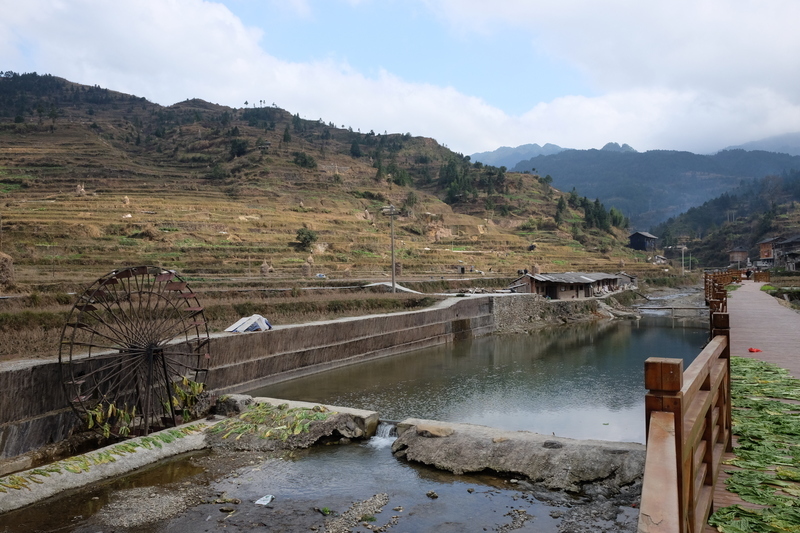 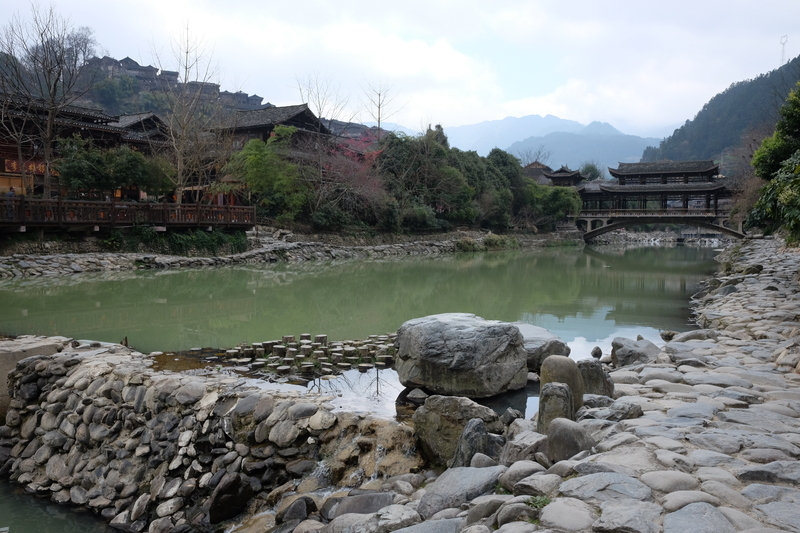 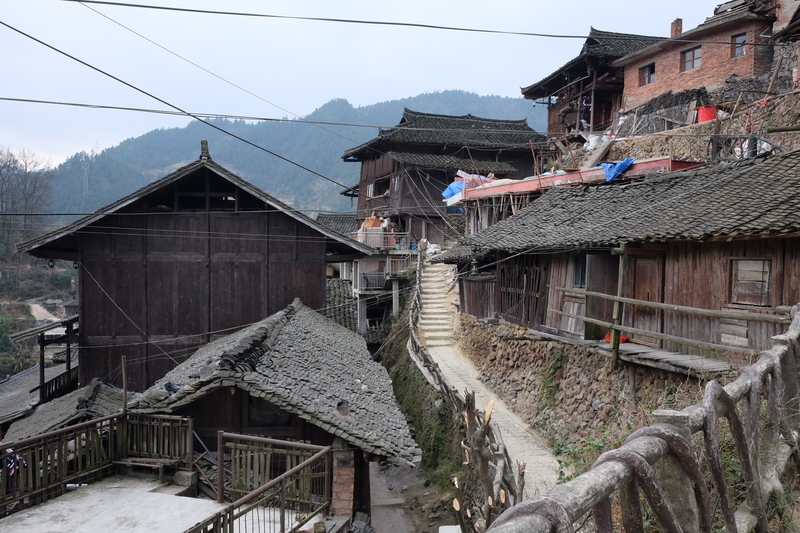 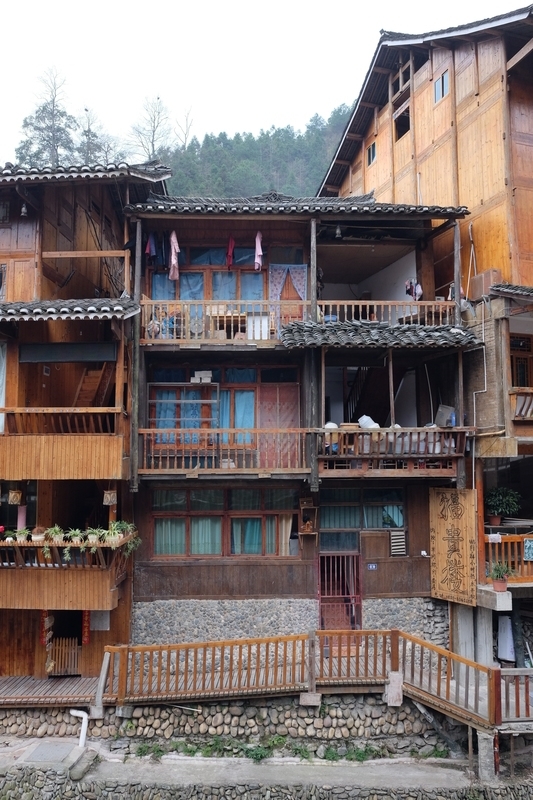 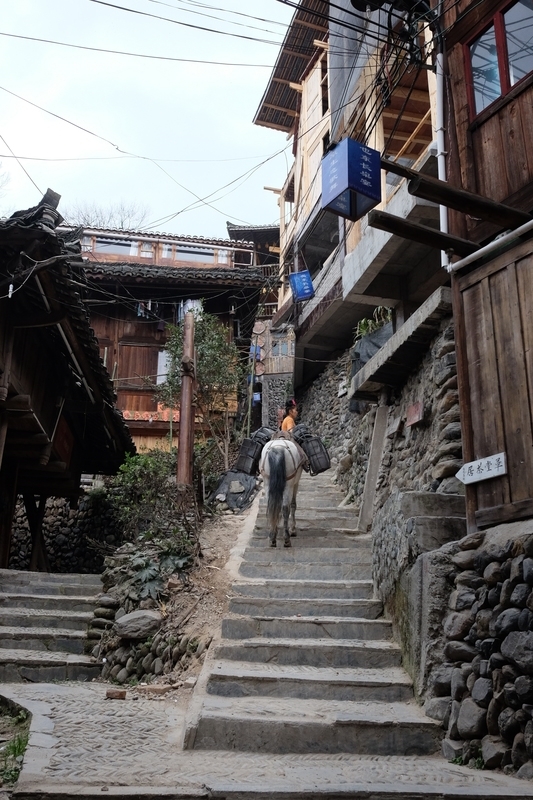 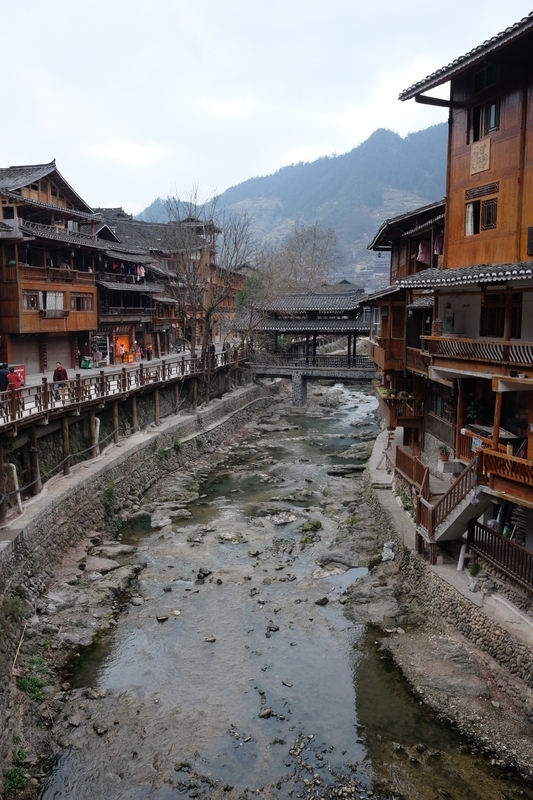 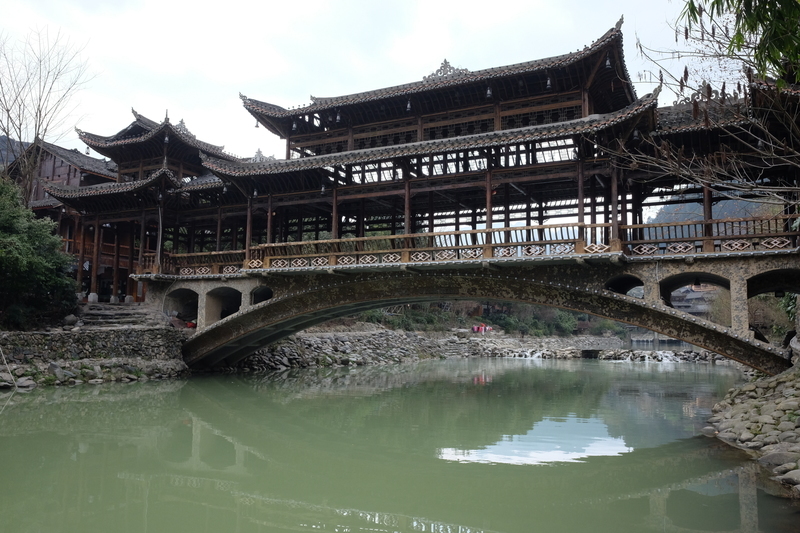 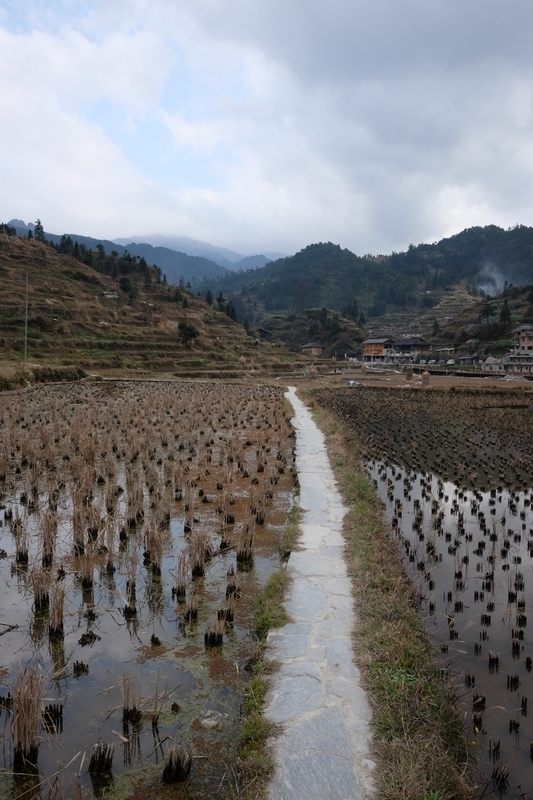 西江寨 “XiJiang village” is today’s stop, and probably one of the more famous of these villages, inhabited by the 苗 “Miao” nationality. 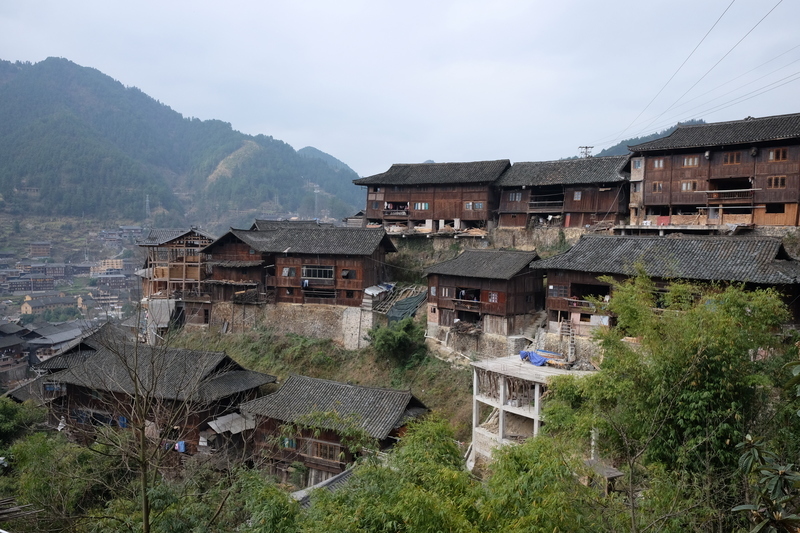 寨 “zhài” can be our word of the day and it means “stockaded village”, you see it in all the place names in this area. 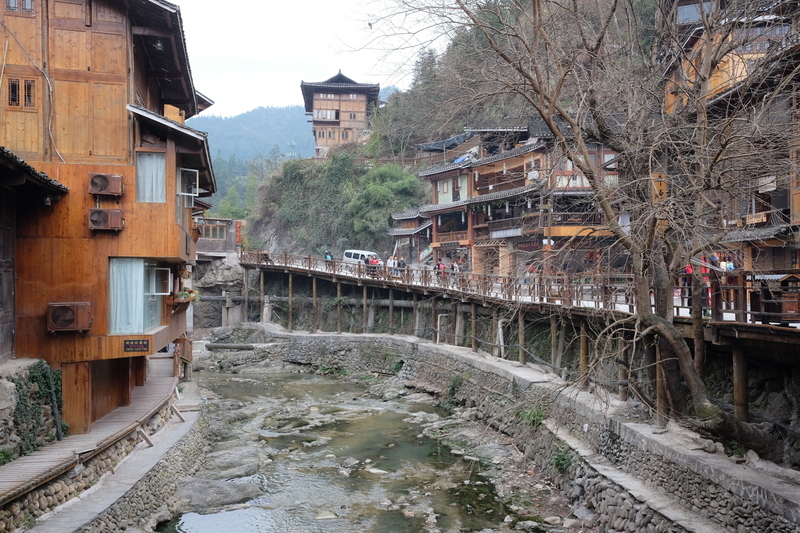 The main street of the village along this river feels a bit touristy and a little too shiny. 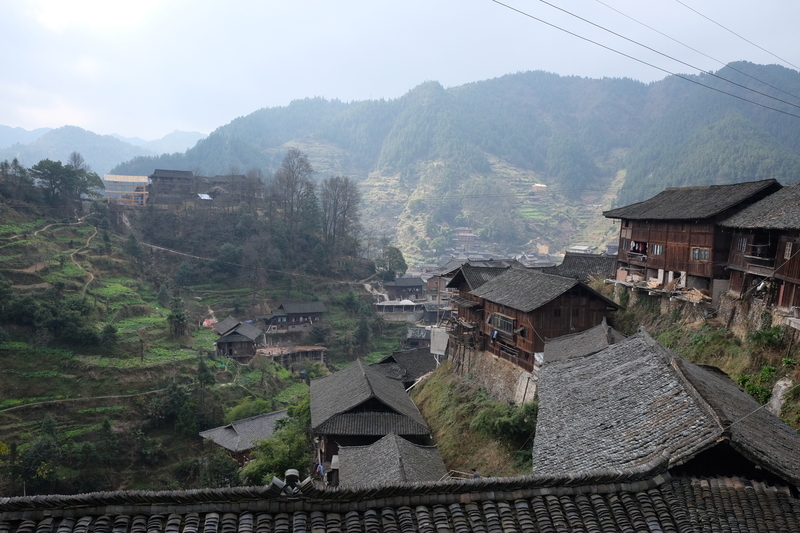 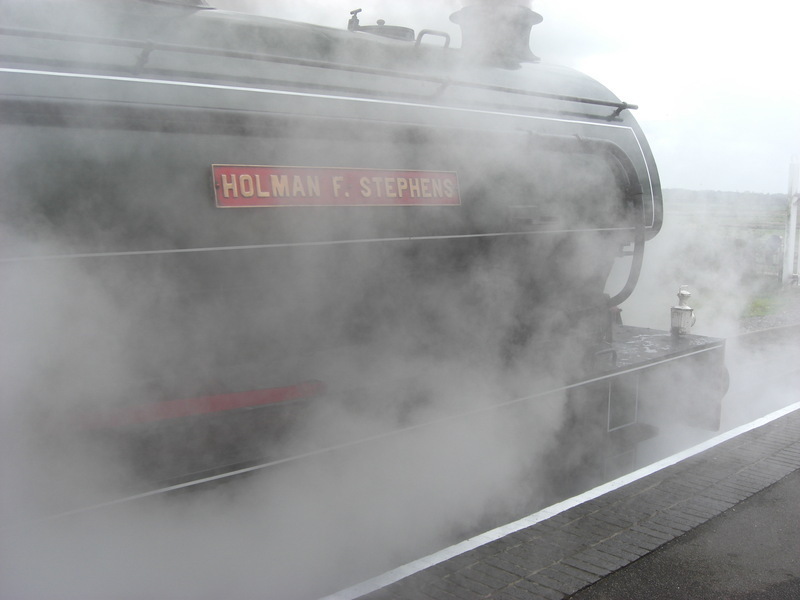 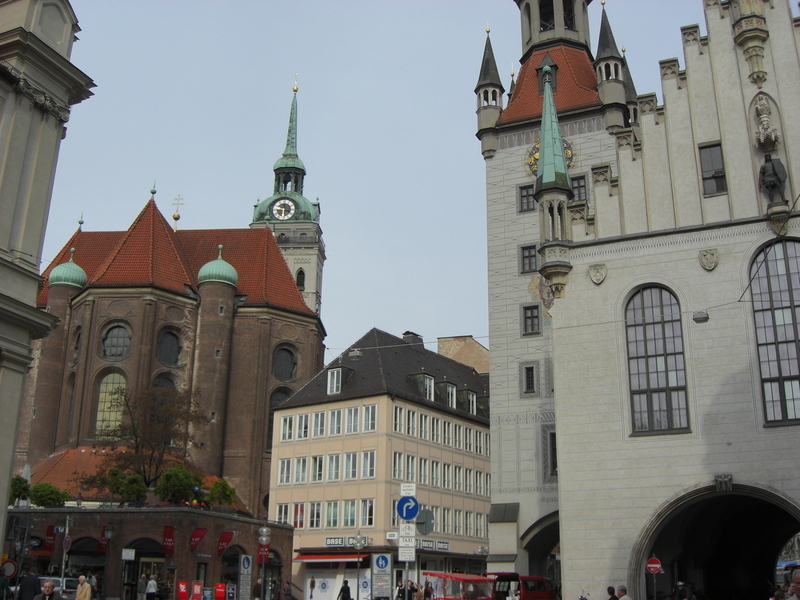 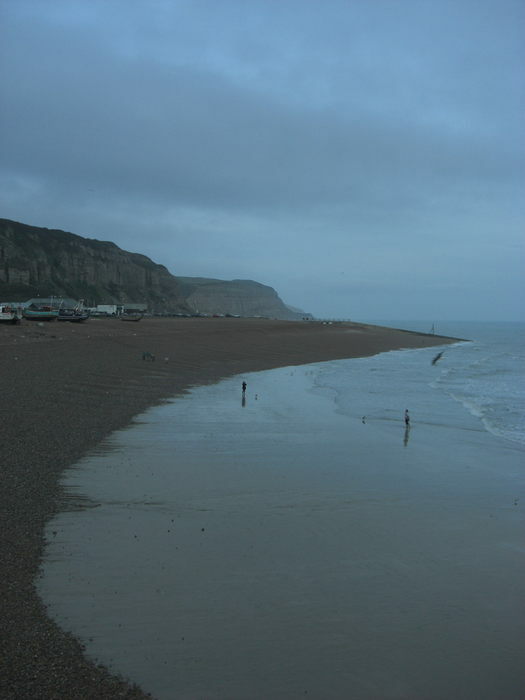 But it’s all very picturesque. 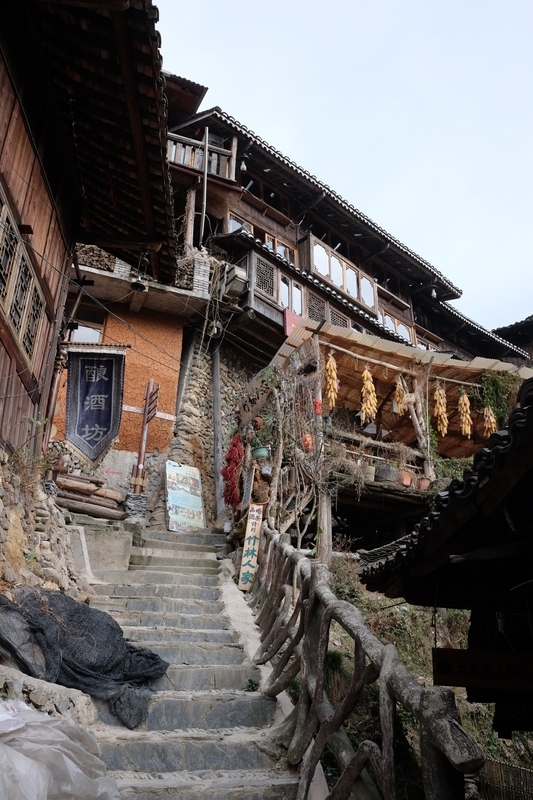 If you head higher up the mountain it starts to become a bit more authentic, and people don’t seem to mind you wandering around peering at their houses. 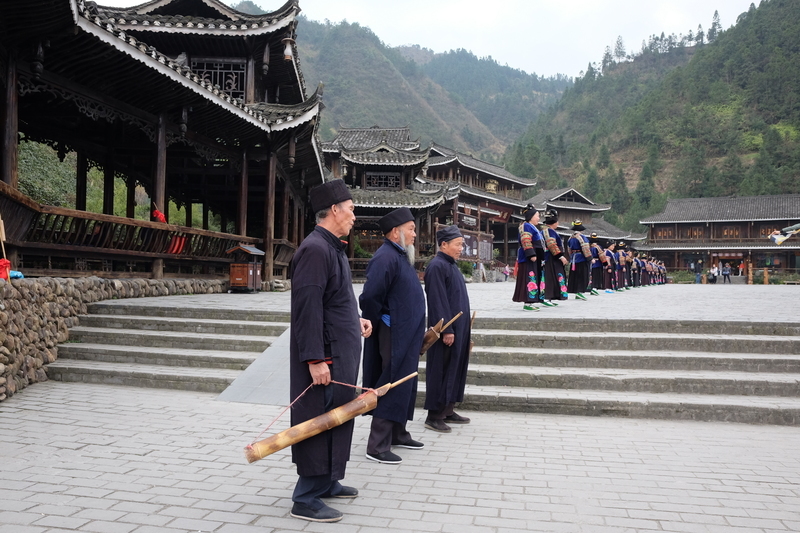 I tried chatting to some of them but their accent was pretty impenetrable, and my Mandarin isn’t great to start with. 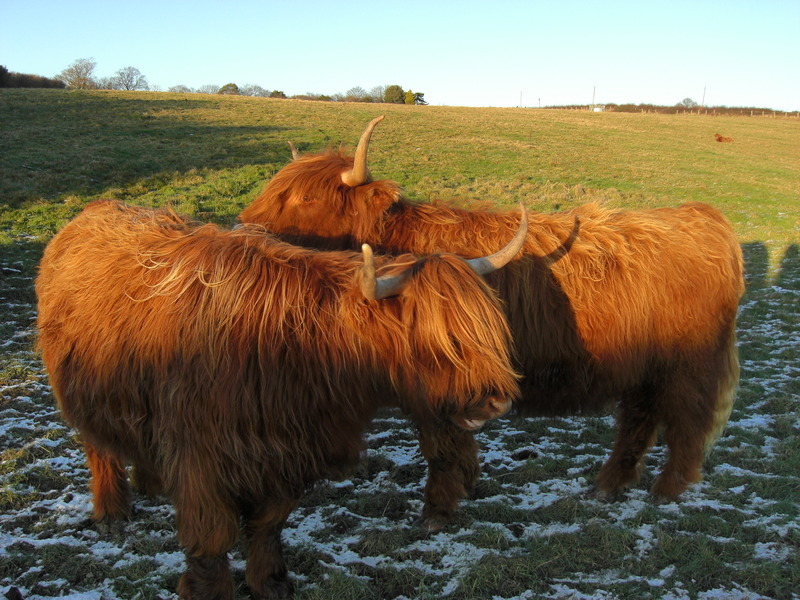 In the afternoon I went for a walk in the countryside nearby. 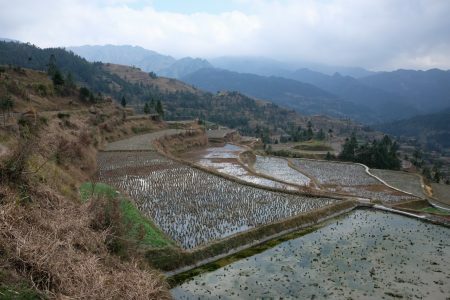 All around are these rice terraces. 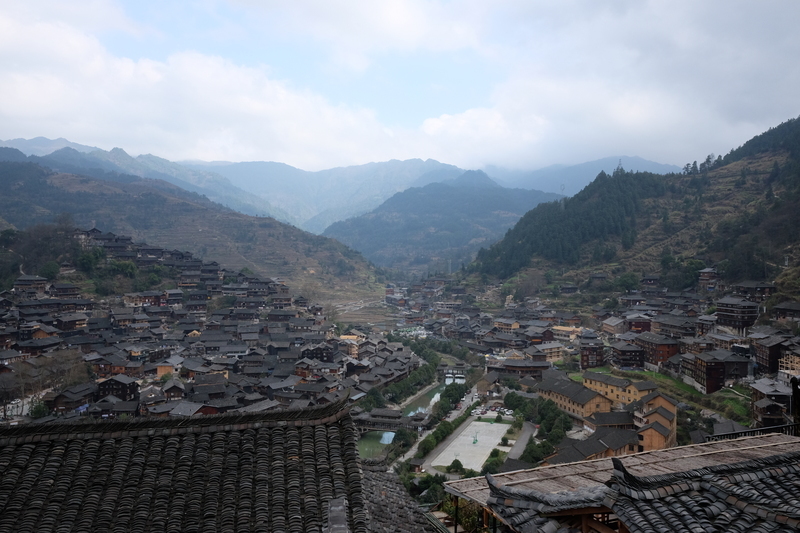 Lonely Planet suggested you could get to another village by walking up over the top of the mountain and into the next valley but the guidebook directions were almost uselessly vague and the upper levels of the terraces were difficult to navigate so I gave up. 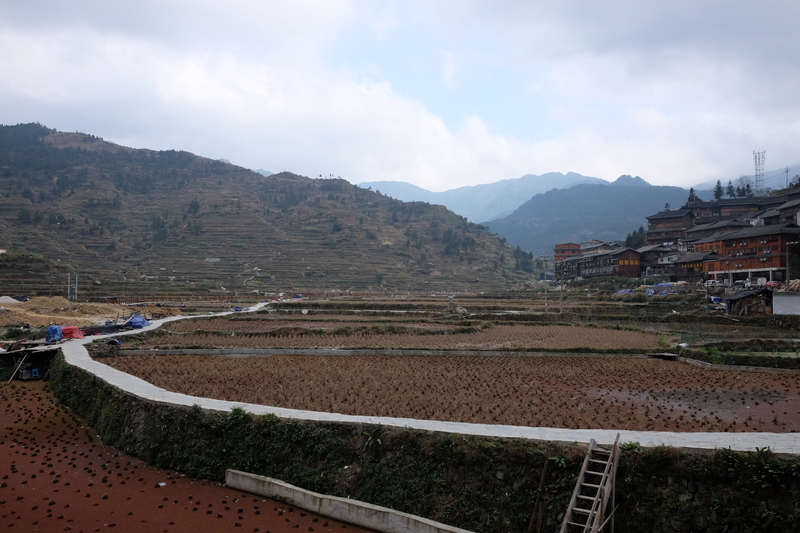 I did notice however that all the rice paddies seemed a bit… dead. 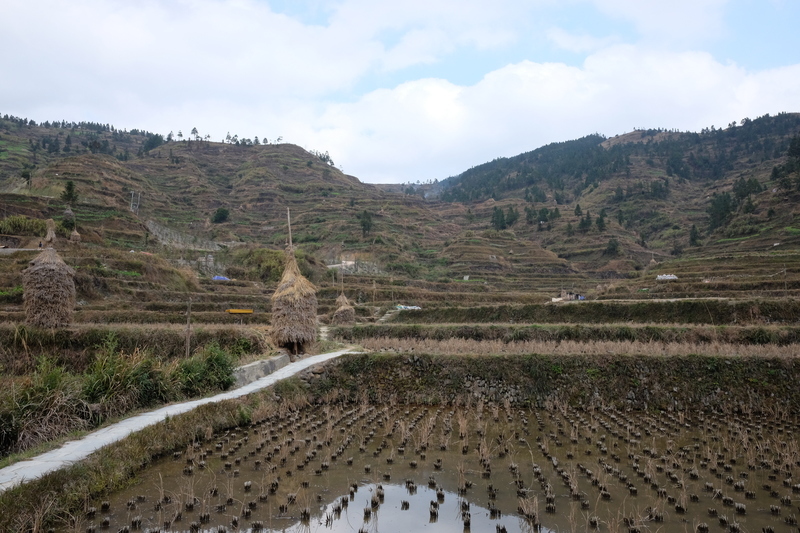 I thought gloomily that maybe all the villages had given up traditional farming to live off the tourism money, but a Chinese friend said it was probably because it’s winter and not the rice growing season so they were off doing other work. 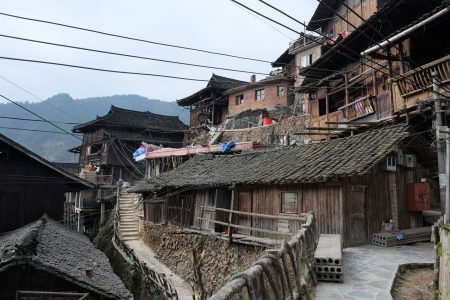 This seemed to be supported by the massive amount of construction work going on, I guess they have to spend that hefty village entry fee on something.